Despite some interface annoyances, this recreation of classic Focusrite gear pushes all the right sonic buttons. … But too faithful in places! No separate de-esser or gate. Graphics don't look a million bucks. Before its more recent branching out into making audio interfaces, plug-ins, DSP devices such as Liquid Mix and more affordable, traditional hardware devices, Focusrite was exclusively an ultra-high-end audio manufacturer. Of particular note were the ISA 110 EQ and the ISA 130 dynamics processor, which have both now been replicated as much more affordable software plug-ins for the Pro Tools LE, M-Powered and HD systems. The Forté Suite comprises several plug-ins, so as well as a full-on channel strip incorporating all elements of both processors, you can have the ISA 110 and ISA 130 as individual instances, or even just the latter's compressor section (but not a solitary de-esser or gate, sadly). 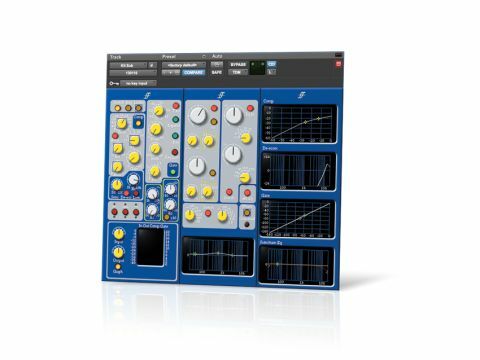 The ISA 110 is a four-band parametric EQ with two adjustable mid bands, top and bottom bands with shelving curves, plus low-pass and high-pass filters. It's a literal recreation of the hardware - which is something of a double-edged sword, as we'll discover. The sound is pretty close to the original but a little edgier, which is good, because the original EQ is very polite around the mid and presence range. This virtual 110 has real bite, to help cut through the mix. The slope of the shelves is fixed and gentle, bringing a silky air to the top end. The downside is that the layout and controls mimic the original, so the frequencies of the top and bottom band are notched (five steps) and the frequency controls of the mid bands have fiddly 'x3' switches to alter the range. The 130 dynamics controller consists of compressor/limiter, expander/gate and de-esser. There's also a three-band filter that can be routed to the sidechain input of either the compressor, the gate or to the main audio. Like the 110, it's true to the original in sound, looks and operation. The compressor is very smooth, especially in the attack transient stage, and is fantastic for invisible control of vocals and acoustic guitar. It's not great for percussive sounds or 'rude' compression, though. As on the hardware, the threshold and ratio are stepped rather than swept, which means for fine threshold settings, you have to adjust the input level control as well. On both plug-ins, you have the advantage of graphic displays (compression graph and EQ curve) that can be clicked into shape, but they're by necessity pretty small. The colour scheme is brash and bold - like the hardware - but the font is very low-res compared to other plug-ins. Focusrite have done the world a favour in recreating their flagship processors for a wider public. Although they could look and feel more expensive, it's the sound that counts, and the Forté Suite isn't lacking in that department.